Electric cars, hybrids and other alternatively-fuelled vehicles (AFVs) are increasingly grabbing market share from traditional petrol and diesel models, new industry figures reveal. The latest statistics from the Society of Motor Manufacturers and Traders (SMMT) show 9,955 AFVs were registered in September, a 56% rise on the same time last year. This accounted for 2.3% of the total market – a 44% year on year rise – in a month that saw a 5.6%rise in overall registrations compared to September 2013. Diesel and petrol vehicles saw registrations grow just under 6% and 4% respectively, but diesel’s market share remained static, while petrol fell one percentage point as a result of the growth in registrations. According to the SMMT, 37,842 AFVs have been sold during 2014, a more than 50% increase on the same point a year ago, while market share has also grown from 1.4% in 2013 to 1.9% this year. An SMMT spokesman told BusinessGreen the AFV market is seeing the benefit of more models coming onto the market – there are now more than 20 plug-in vehicles available compared to six in 2011 ranging from hatchbacks and saloons to SUVs and sports cars – while consumers are increasingly aware of the advantages of zero emissions driving. Of the 9,955 AFVs registered in September, 3,090 were eligible for the government’s plug-in grant that offers up to £5,000 off the cost of a pure-electric or plug-in hybrid vehicle. Since the scheme was launched in January 2011, there have been 14,274 eligible cars registered. The SMMT data shows pure electric and plug-in hybrids saw the greatest year on year growth, rising 181% and 1,101% respectively on September 2013. Plug-in hybrids have also shown the largest growth in year to date registrations, rising 454% to 4,303. 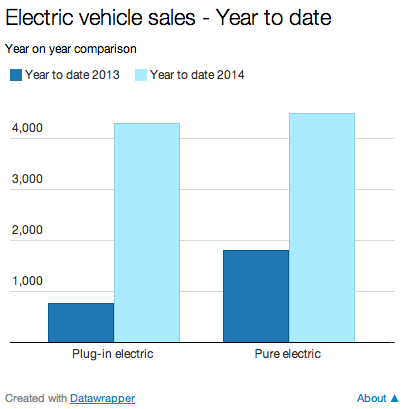 Electric car manufacturers were quick to hail the growing market. Nissan said it had notched up record sales of its all-electric Leaf during the month, selling 851 units compared to 332 in September last year, which comprises around 70% of the market and represents the largest volume of Nissan Leafs ever sold in one month in a European market. The Japanese company has recorded 2,969 Leafs sold so far this year, already outpacing the 1,812 it sold during the whole of 2013, and achieving a 68% share of the electric vehicle (EV) market. “September’s result gives us a clear indication that motorists are beginning to recognise that switching to a Nissan Leaf is not a compromise but an opportunity,” said Paul O’Neill, EV manager at Nissan Motor GB Limited. Meanwhile, Mitsubishi said the SMMT figures showed its Outlander PHEV (plug-in hybrid vehicle) accounted for over half of the 1,885 plug-in sales during September. Obviously the volumes are still small at the moment, but with the government investing £500m in supporting the EV market and auto makers unveiling an even wider range of models, the direction of travel is increasingly clear.